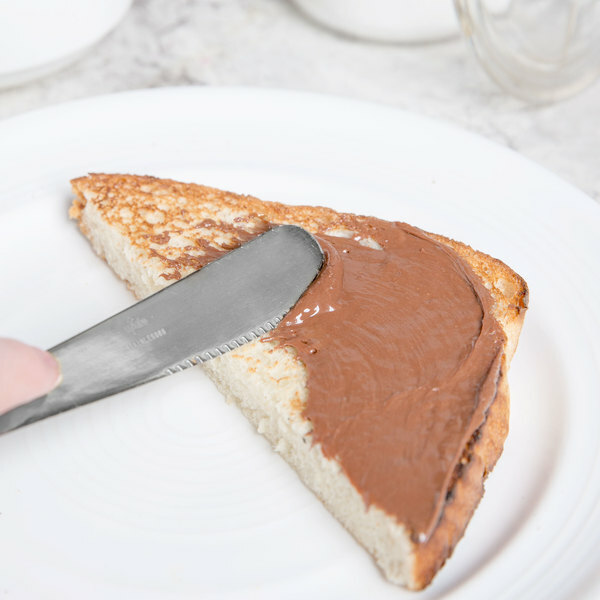 Treat your patrons to the fine taste of this smooth and creamy Nutella hazelnut spread! It spreads easily on top of pancakes, waffles, and toast. Perfect for traditional French crepes or fresh-baked croissants, it's also great in brownies, cheesecakes, and cookies. 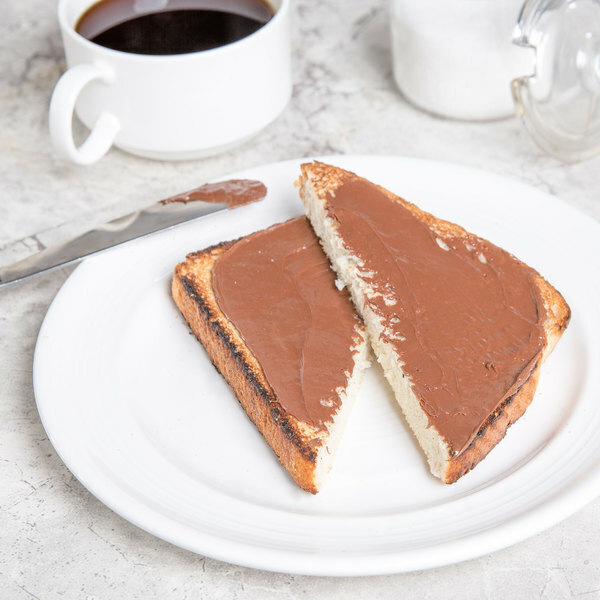 Whichever way you decide to serve it, your customers are sure to love Nutella! Use it right out of the container for breakfast offerings and desserts, or mix it into your most popular recipes. Nutella selects fresh raw materials and quality ingredients to make their signature hazelnut spread. Widely known around the world, Nutella has a unique flavor and contains no artificial colors or preservatives. It's made with sugar, skim milk, finely-ground hazelnuts, and hints of rich cocoa. The ingredients come together to make a silky smooth paste that's not too thick or thin. Use this large 26.5 oz. jar to keep your restaurant, bakery, hotel, or event well-stocked! This item has been Halal certified by the National Independent Halaal Trust and it is permissible under Islamic law. It is NUTELLA, so of course it tastes great. They arrived perfectly and on time. You save money on each jar by buying 12 case, compared to other grocery stores. So Great Value. 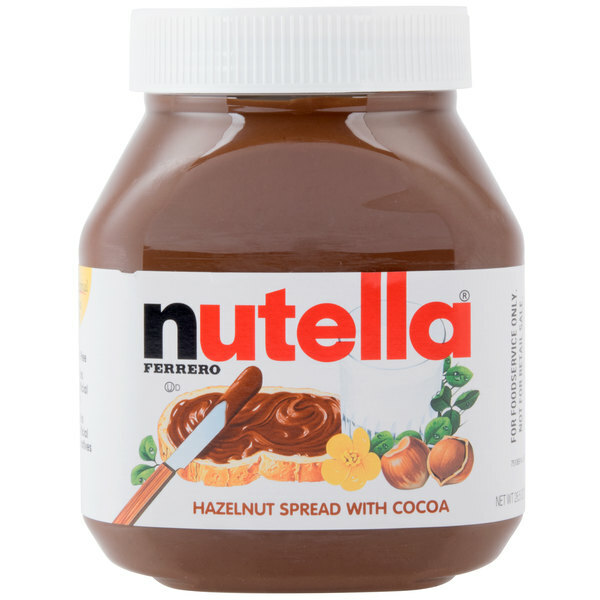 We like this nutella Hazelnut, its perfect to spread on top of bread, cookies, also crepes. The best things is that no contains artificial color or preservatives. I love nutella, great to use in restaurants, parties and events, the best thing is that no contains artificial color and the price is fabulous. The case came packaged well for shipment. You can’t go wrong with Nutella, so my business buys cases of these at a time! We haven’t had a problem with these cases at all. Nutella!! This stuff is amazing! It easily spreads on toast! This is really good price for the size compared to major grocery stores! I would definitely be buying more in the future. My family and i absolutely love this spread!!! I like that you can bake into a variety of different desserts but also taste great with fruits. This Nutella Hazelnut spread is sooooo good! Takes me back to childhood. The price for a jar of this size is definitely a win. Great on bread! Nutella Hazlenut Spread is a delicious product that has made quite an impact! Bake it into brownies, whip it into frosting or just sneak a spoonful out of the jar. It is delicious and this 12 piece case is a great price. Nutella makes waking up so wonderful. I love spreading some on a piece of toast (eating it with bananas is great too). My kids are obsessed! 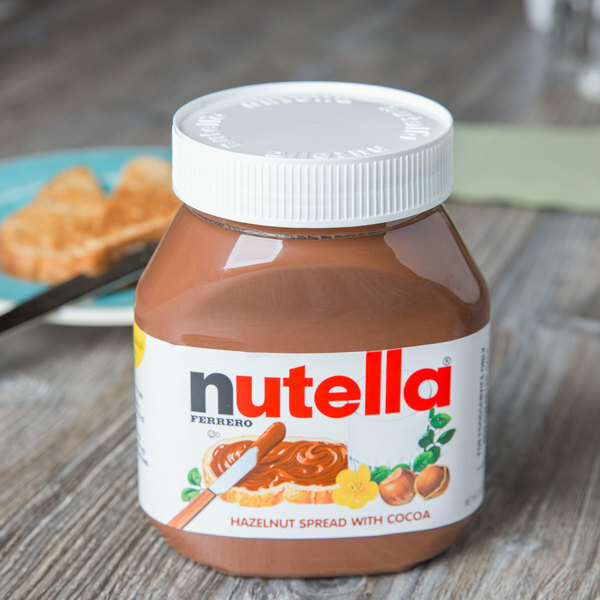 Nutella Hazelnut Spread is great for desserts, pastries, and crackers to add a sweet, textured chocolate taste. The 26.5 oz Jar from Webstaurant is a great value. The Nutella Hazelnut Spread comes in a jar of 26.5 oz. which is a great size to store for home use with Children or adults who loves Nutella Spread so much. Great jar for the money! It is also very economical for food service as well. The Nutella Hazelnut Spread 26.5 oz. Jar is a good value for the classic, chocolaty nutella spread. It can be used for desserts or snacks. Everyone loves nutella. I have this stuff in all of my kitchens and we use it for all kinds of desserts that we offer in our restaurant. It is delicious. 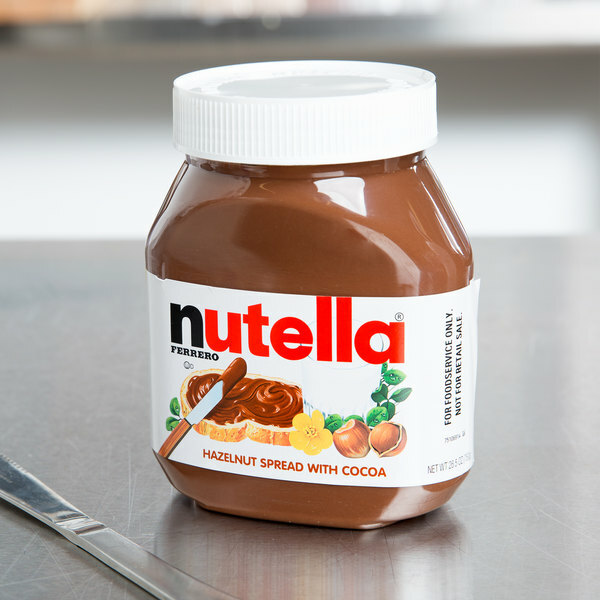 This is the awesome world famous Nutella is the best spread to have around. Good for anything, like toast and crackers and pancakes and crepes. The list is endless! Wow! Chocolate hazelnut heaven! Delicious always wanted to try but never did till know thanks Websturant.This nutella spread is amazing! It is Smooth, creamy, fragrant and wonderful to the pallet! Nutella is the most amazing substance on the planet! It is a chocolate hazelnut spread that is the consistency of a thick chocolate ganache. It is amazing in sandwiches, in crepes, in waffles...Everything is better with Nutella! Nutella is an amazing tasting topping that you can add to many different things. Personally, I love it with apples and bananas. This is a must have for every kitchen. While this is very sweet, it is liked by most children and adults and it's a unique chocolatey nutty flavor and pairs well with rice crackers or as a topping with apple slices or pears for a healthier dessert. It also has some protein and omegas because of the hazelnut content. I love Nutella! It tastes amazing by itself, spread on fruit, toast, or added to different recipes to give it that something extra. I could eat it out of the jar by itself. Super creamy and perfect with just about anything. I love Nutella so much. I normally buy it from my local grocery store but seeing how affordable it is ok webstaurant I will start purchasing it here. Great prize and a must have if you have a crepe shop. Only problem is that each bottle does not come with a barcode if you do want to also sell them retail and use your barcode scanner for proper inventory control. Nutella has one of the greatest flavors of all time. It's so rich and feels like you're eating semi melted chocolate. I always buy this in 2 packs. This amount of Nutella is perfect for home use. It's enough to use multiple times but sometimes the oil separates and you do have to stir it. I wasn't crazy about Nutella when I first tried it, but I needed to find a way to use it so that I wouldn't waste the jar. I put a spoonful inside of puff pastry and folded the dough over itself forming a sort of pocket, baked it, then topped it with powdered sugar. I've loved it ever since. i'm pretty sure everyone knows what Nutella is at this point. this size is great for large batches of products and will last a long time depending on how you use it. it's delicious and a great deal. I love this stuff! I buy it for my home and commercial kitchen. It's delicious and is perfect on bananas, toast, and in truffles. I like to get big portions! I decided to give this Nutella Hazelnut Spread 26.5 oz. Jar a try and I am so glad I did. I love the hazelnut flavor and it's so creamy. I will buy more of these for sure. If you don't absolutely love Nutella then we are no longer friends. The creamy texture of this product is perfect on pancakes, cookies, or even dipping for pretzels! Chocolatey and sweet tasting. Nutella is a leading brand in many markets due to its freshness and wholesome ingredients. Tastes wonderful on bread, pastries and even as a topping on desserts! Great spread in packaging just perfect for home usage or small operation.. You will enjoy quality and price. This spread is just irreplaceable! I would recommend this product! I love Nutella, and this is a great sized jar for residential use. This will definitely last me for months, yet it isn't too large that it's hard to store.